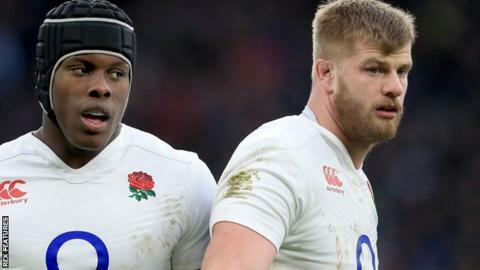 England forwards Maro Itoje and George Kruis have extended their contracts with Premiership champions Saracens. Second-rowers Itoje, 21, and Kruis, 26, will now remain at Allianz Park until the summer of 2019. The pair were integral members of Eddie Jones' England side which won the Six Nations Grand Slam this year. "They have been in superb form this season for both club and country, and they are only going to get better," said Sarries boss Mark McCall. Itoje only made his international debut as a replacement against Italy in February but went on to start the final three games of England's Six Nations campaign, prompting Jones to suggest that he had developed from a "Vauxhall Viva into a BMW". He joined Sarries at the age of 14 and made his first-team debut for the north London club in May 2014. "Maro's progress over the last few seasons has been phenomenal," said McCall. "He's experienced a lot of big games for the club already, has played for England and is still only 21, which is incredibly exciting." Kruis, also a product of Saracens' academy set-up, made his first appearance for the club in November 2009 and has won 15 England caps since his bow against New Zealand in 2014. "In George we have one of the finest lock forwards around - a player who has shown consistent improvement and still has so much more to come," added McCall.